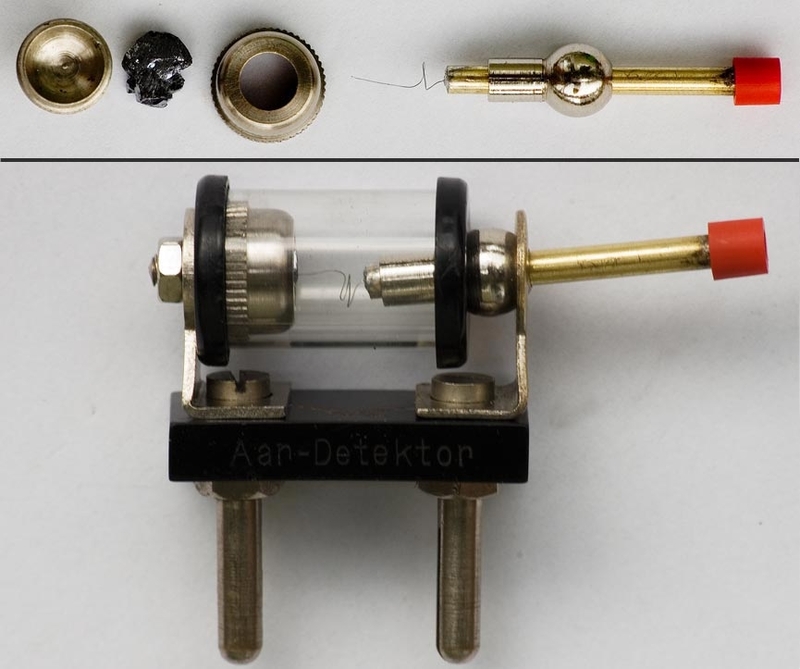 A crystal set brings radio to life for a 6 year old. The time was the winter of 1949 when, at the age of 6, I was watching my uncle and his friend try to make a rock talk to a pair of earphones. There they were with a rock of galena, a cat whisker, an oatmeal box wrapped with wires and two wires going out the window, one to grandpa’s cherry tree and the other to the water pipe of grandma‘s sink. My uncle is trying to get the cat whisker to find a soft spot on that rock and I am very confused. A cat whisker? Is that a whisker taken from grandma’s poor cat? What is a soft spot on a rock? I know any rocks that hit my head did not have a soft spot. Why do they have an oatmeal box all wrapped up with wires. How did they get that wire up to the top of grandpa’s cherry tree? And of course, why are they worried about having a good ground. Now that is another one that has me confused. They are standing on grandma’s nice clean kitchen floor but to have a ground, I guess they will need some good dirt from grandpa’s garden. I always heard grandpa say to grandma, that’s some good ground out there. Now I am watching my uncle and his friend trying to find that soft spot on that rock. My uncle has a set of earphones on his head and here comes the cat. I grab the cat because I do not want the cat to lose any more whiskers. But to my amazement, the cat still has all of its whiskers. My uncle has a box of my favorite cereal, Quaker Oats, all wrapped up with wires. 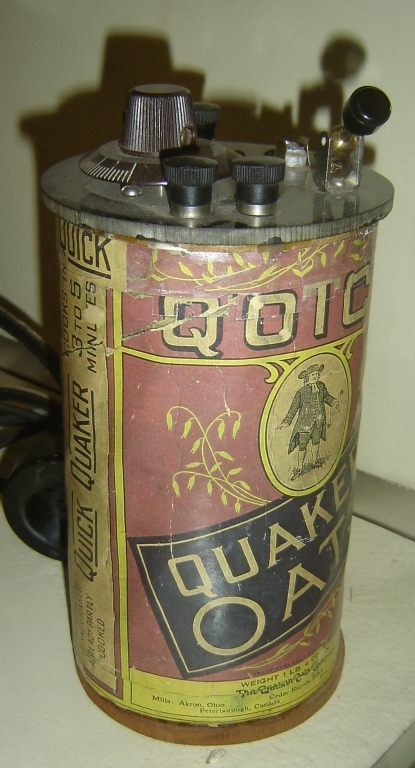 They are calling this a “coil,” but to me it is just a Quaker Oats box all wrapped up with wires. What do they hear? Hey, these two guys have smiles on their faces as if they won the biggest prize in the world. Now comes the moment that changed me for the rest of my life. My uncle grabs me and puts the earphones on my head. To this day I will always remember: “This is WISL, 1480 on your radio dial.” “What is this?” I cried “A rock that talks?” No, my uncle says. 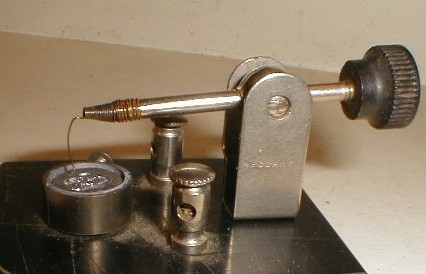 It is a homemade crystal radio and you can pick up radio station signals to listen to them. I am now very excited to know that rocks can talk and then while I have the earphones still on I heard the following: “CQ CQ CQ this is W3SCB calling on 40 meters.” “What is a W3SCB?” My uncle’s friend says it is a “ham” radio operator. Now I got a rock that talks. Cat whiskers but not from a cat. 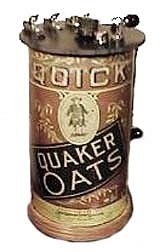 An oatmeal box wrapped up with wires that is called a coil and wires to a cherry tree and a ground that does not have dirt. But a “ham.” I like a ham sandwich, but I never heard a ham sandwich talk and here was a ham talking through a rock. Boy, am I ever confused. My uncle’s friend says a ham is a person who builds and plays with radios so that he can talk to other hams all over the world and when I get bigger and learn some things about radio, I too, can be a ham radio operator and talk to people all over the world. Eventually, my uncle gave me that “rock that talked” and I would eagerly listen to the one-sided conversation of W3SCB on 40 and 80 meters and the local radio station. As I got older, I built a one tube radio. I could hear more stations. I was told if I could copy 5 WPM of Morse code and pass a written FCC Novice exam I could become a ham radio operator. So in August of 1957 I passed the code test and the Novice exam and waited until November to get my “ticket” and the call of KN3BVQ. From that simple “rock that talked,” I have enjoyed many years of ham radio. I have operated CW, SSB, PSK, FM, various activities of Field Day, contests and providing radio communication for civic events such as parades, cross-country horse races and various 5K and 10K races. The years have gone by but, for me, the “rock that talked” will always be the driving force that opened the gates to the world’s greatest hobby of ham radio. Edward Leshinskie, K3BVQ, an ARRL member, has been licensed since 1957. First licensed as KN3BVQ, he now holds an Advanced class license. Ed is a retired high school chemistry and physics teacher and is an active member of the Pottstown Area Amateur Radio Club. Ed enjoys low power operating using CW with his old J-38 straight key. Ed is also active in the Montgomery County ARES/RACES. You can contact Ed at PO Box194, Pottstown, PA 19464.